And particularly this lot, a selection of adoptive mothers from the animal kingdom to have you weeping into your Shreddies. Enjoy. Whether the tiger was really fooled by these jackets or just appreciated the piglets’ way with animal prints we may never know, but the resulting mother/child relationship was like a beautiful Jungle Book and Babe mash-up movie come to life. 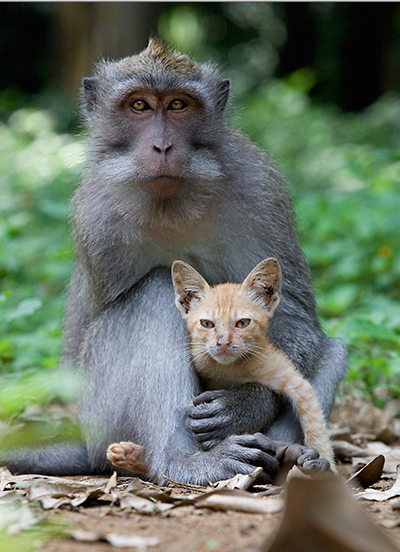 Despite the impressive grey whiskers, this monkey is still a youngster itself – but it was spotted protecting, nuzzling and grooming its adopted ginger kitten at the Monkey Forest park in Bali. Tschuh, why do parents always have to do that in public? Did y’all hear the story of Rocky, the tiny baby squirrel who fell from the sky and was adopted by a generous mother cat? Watch and sniffle, folks. You also get to marvel at the way Americans pronounce squirrel ‘squirl’, which is a bonus. 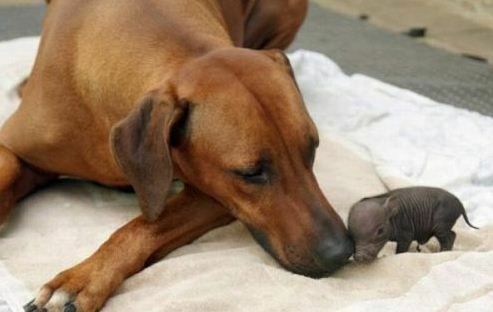 Did you ever see anything as precious as Katjinga, the mother dog who adopted a two week-old orphan piglet found abandoned in the woods? Or, as we mistakenly labelled this photo, ‘dog adopts tiny elephant’. Fluffy animals adopting other fluffies is cute, yes, but somehow there’s something even better about tough animals displaying a maternal side – mainly because you can imagine the whole thing being turned into a smash hit Disney Pixar. This home video from the late 90s shows Moses, a wild crow ‘with no known history of humanitarian benevolence’ (because they checked his records for that kind of thing) adopting and raising Cassie, a stray kitten. He’d be voiced by Russell Crowe, naturally. Here’s a story to coo over: Noah the one-legged pigeon (apparently all inter-species adoptive animals have biblical names) was living in animal rehab when one day he took a shine to three orphan bunny siblings who lived in the cage next door. The feeling was reciprocal, and before long Noah had taken his teeny pals under his wing. 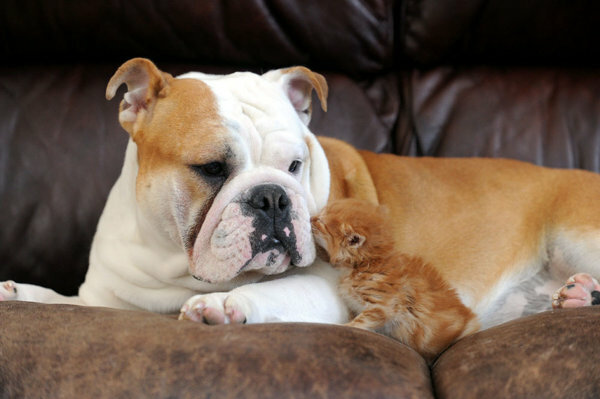 Does the tale of Harley, the grumpy bulldog-turned-foster-mum to abandoned kitten Tigger, make us feel warm and shmooshy inside? In the words of another famous bulldog, ohhhhhhhhh yes.